Much healthcare research is currently wasted because its findings are unusable.1 Published reports of intervention trials often focus on the results and fail to describe interventions adequately. For example, a review of 80 studies selected for the journal Evidence Based Medicine as both valid and important for clinical practice found that clinicians could replicate the intervention in only half the studies.2 Interventions may be used incorrectly or not at all if there is inadequate detail in the trial protocol, on the conduct of the trial, in systematic reviews and guidelines, and finally during implementation (fig 1⇓). This is an unnecessary but remediable waste, as we discuss below. This list is readily adaptable for interventions beyond clinical treatments and encounters—for example, to health systems and other complex interventions. Attention should be paid to the different meanings that terms such as counselling or physical therapy may have in different settings. Space constraints in trial registration databases and scientific journals may restrict full reporting of interventions. Potential solutions include complying with WHO requirements for reporting interventions, adding web hyperlinks to trial registration records and other documentation,4 as recommended by signatories to the Ottawa statement (ottawagroup.ohri.ca) and on other websites where protocols are reported. Trial reports should describe the extent to which the intervention, as delivered, was consistent with the protocol. Fidelity can have several dimensions: whether components are delivered as prescribed (adherence); the amount of exposure to the content; the extent to which the delivery was aligned with the underpinning theory (quality); and the degree to which participants engaged in6 or modified the intervention. Poor fidelity will lead to unclear or misleading conclusions. Interventions can involve several actors. Though clinicians may deliver the intervention, participants may not adhere to it. Hence the role of both clinician and participant needs to be described. An example of good practice is the DiGEM trial of self monitoring of blood glucose concentrations,10 for which the nurse training manual describes the intervention and timing of delivery in detail, with the intended effect and the required level of knowledge, skills, and behaviour for the research nurse and the person with diabetes. Providing support material for trial participants that promotes adherence. Any drift away from fidelity during the trial should be reported when the study is published. This complicates decisions about which configuration of the intervention to implement. With rare exceptions21 reviewers seldom attempt to improve descriptions of interventions. Conceptual frameworks may facilitate the classification and description of interventions. For example, a review of “audit and feedback” classified interventions according to intensity and provided examples to illustrate different intensities.22 This categorisation was intuitive and not based on theory. Using theory may lead to conceptually more coherent categories and therefore more meaningful results. One method of identifying the active ingredient(s) of an intervention is to systematically specify them—and control comparison conditions—using standardised taxonomies and then use meta-regression to show effects hidden by more conventional methods of synthesising evidence.24 25 Taxonomies help ensure a planned approach to analysis, particularly when heterogeneity prevents meta-analysis. Taxonomies facilitate the process of accumulating knowledge across heterogeneous studies, making it easier to update reviews and identify gaps. Mechanisms underlying an intervention can be investigated by linking active ingredients to hypothesised causal mechanisms (theory) through approaches such as “realist synthesis” or consensus among content experts. 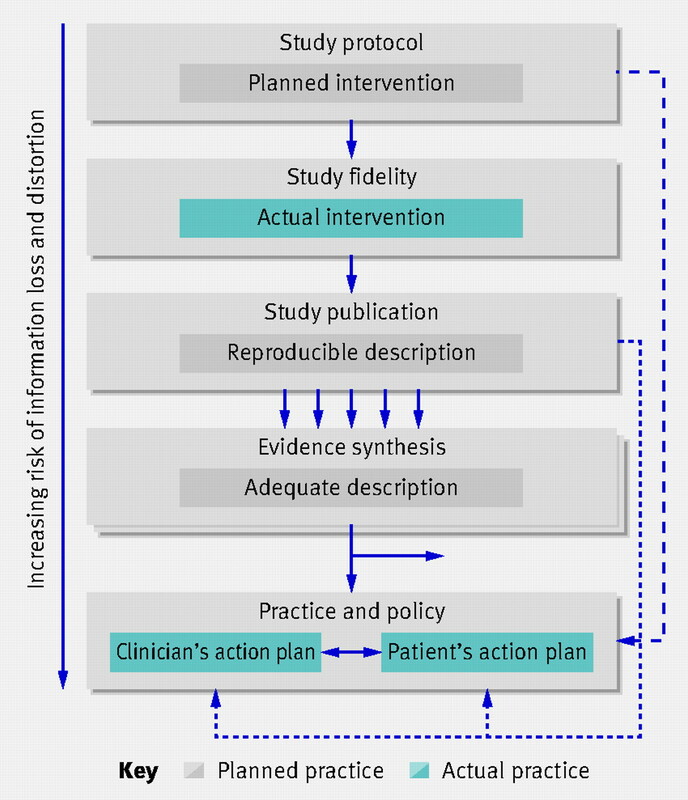 Unless there is clarity about what interventions involve, patients and health professionals cannot ensure they receive beneficial interventions or avoid unhelpful or harmful interventions. Patients, practitioners, and policy makers learn about interventions directly from trials and systematic reviews or, more commonly, from intermediaries and secondary sources (websites, advice centres, media, clinical practice guidelines, librarians) or practitioners. The details of evaluated interventions should be readily available in the public domain. The minimal elements of knowledge that patients (or the providers of information to patients) need about the intervention are who, what, when, and how, as we set out above. Additionally, clinicians may need information about skills, equipment, or referral sources to provide effective treatment. The box gives our proposals to increase the usefulness of research reports (box). We thank Mike Clarke and the reviewers for helpful comments and Mary Hodgkinson for organising meetings. The costs of the meeting were in part covered by PG’s NIHR fellowship. Contributors and sources: PG organised and IC chaired a two day consensus meeting of the authors to discuss the problems of reporting trial interventions, develop a guide on describing interventions throughout the research process, and prioritise recommendations to reduce information distortion and loss. All authors contributed to discussions and writing of the paper. Competing interests: All authors have completed the unified competing interest form at www.icmje.org/coi_disclosure.pdf (available on request from the corresponding author) and declare no support from any organisation for the submitted work and no financial relationships with any organisation that might have an interest in the submitted work in the previous three years; TG is an editor at the BMJ but was not involved in the peer review process. DG is an employee of the World Health Organization and works on trial registration. DA is an executive member of the EQUATOR network. Lustria ML, Cortese J, Noar SM, Glueckauf RL. Computer tailored health interventions delivered over the web: review and analysis of key components. Patient Educ Counsel2009;74:156-73. Pomeroy VM, Cooke E, Hamilton S, Whittet A, Tallis RC. 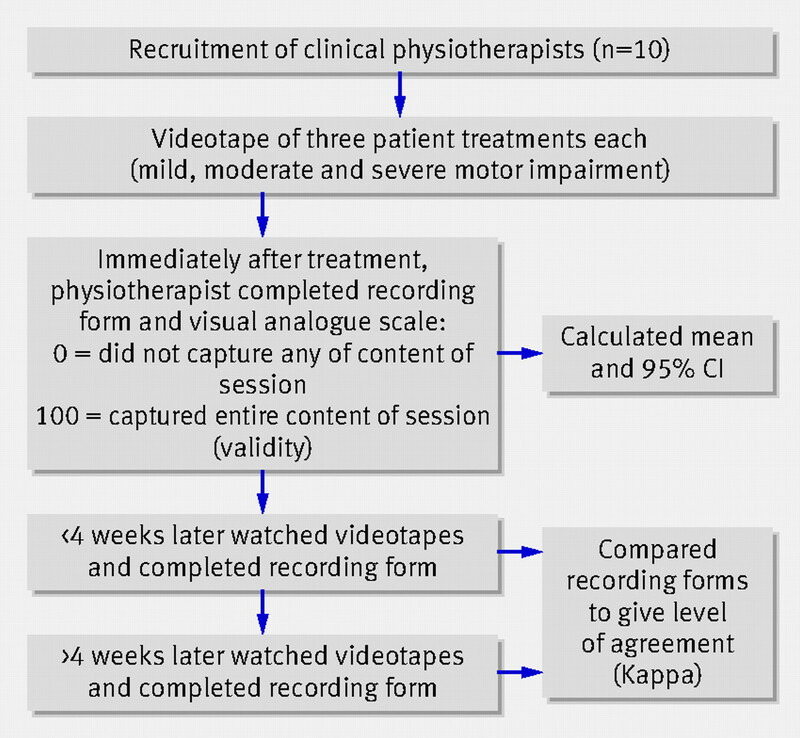 Development of a schedule of current physiotherapy treatment used to improve movement control and functional use of the lower limb after stroke: a precursor to a clinical trial. Neurorehabil Neural Repair2005;19:350-9. Dane AV, Schneider BH. Program integrity in primary and early secondary prevention: are implementation effects out of control? Clin Psychol Rev1998;18:23-45. Gossec L, Tubach F, Dougados M, Ravaud P. Reporting of adherence to medication in recent randomized controlled trials of 6 chronic diseases: a systematic literature review. Am J Med Sci2007;334:248-54. Lubell Y, Reyburn H, Mbakilwa H, Mwangi R, Chonya S, Whitty CJ, et al. The impact of response to the results of diagnostic tests for malaria: cost-benefit analysis. BMJ2008;336:202-5. Hardeman W, Michie S, Fanshawe T, Prevost AT, McLoughlin K, Kinmonth AL. Fidelity of delivery of a physical activity intervention: Predictors and consequences. Psychol Health2008;23:11-24. Farmer A, Wade A, French D, Simon J, Yudkin P, Gray A, et al. Blood glucose self-monitoring in type 2 diabetes: a randomised controlled trial. Health Technol Assess2009;13:1-72. Glenton C, Underland V, Kho M, Pennick V, Oxman AD. Summaries of findings, descriptions of treatments, and information about adverse effects would make reviews more informative. J Clin Epidemiol2006;59:770-8. Jacquier I, Boutron I, Moher D, Roy C, Ravaud P. The reporting of randomized clinical trials using a surgical intervention is in need of immediate improvement: a systematic review. Ann Surg2006;244:677-83. Thabane L, Chu R, Cuddy K, Douketis J. What is the quality of reporting in weight loss intervention studies? A systematic review of randomized controlled trials. Int J Obes (Lond)2007. Boutron I, Moher D, Altman DG, Schulz K, Ravaud P, for the CONSORT group. Methods and processes of the CONSORT group: example of an extension for trials assessing nonpharmacologic treatments. Ann Intern Med2008:W60-W67. Workgroup for Intervention Development and Evaluation Research. WIDER recommendations to improve reporting of the content of behaviour change interventions. 2009. http://interventiondesign.co.uk/wp-content/uploads/2009/02/wider-recommendations.pdf. Perera R, Heneghan C, Yudkin P. Graphical method for depicting randomised trials of complex interventions. BMJ2007;334:127-9.
WHO Safe Surgery Checklist. Instructional videos. www.who.int/patientsafety/safesurgery/tools_resources/en/index.html. Craig P, Dieppe P, Macintyre S, Michie S, Nazareth I, et al. Developing and evaluating complex interventions: the new Medical Research Council guidance. BMJ2008;337:a1655. Langhorne P, Pollock A, with the Stroke Unit Trialists Collaboration. What are the components of effective stroke unit care? Age Ageing2002;31:365-71. Jamtvedt G, Young JM, Kristoffersen DT, O’Brien MA, Oxman AD. Audit and feedback: effects on professional practice and health care outcomes. Cochrane Database Syst Rev2006;2:CD000259. Rubenstein LV, Williams Jr JW, Danz M, Shekelle P. Evidence synthesis for determining the key features of effective depression interventions. 2009. www.hsrd.research.va.gov/publications/esp/#depression. Michie S, Abraham C. Advancing the science of behaviour change: a plea for scientific reporting. Addiction2008;103:1409-10.